Lower back pain ranks among the most common health issues affecting Americans today, with the American Chiropractic Association reporting that one-half of all working Americans experience lower back pain symptoms every year. Out of these people suffering from lower back pain, at least $50 billion dollars is spent each year addressing and resolving their condition. Furthermore, 80 percent of the population will suffer a lower back problem at some point in their lives. Lower back pain qualifies as the single leading cause of disability in the world, according to the Global Burden of Disease 2010. Low back pain is the number one type of chronic pain experienced in the nation today–with 27 percent of Americans reportedly suffering from this variety of bodily pain. In addition to lower back pain, patients also complain of upper, middle, and lower back discomfort with sciatica nerve pain (leg tenderness as well as numbness). Common causes of lower back discomfort include arthritis, degenerative disc disease, or nerve and muscular afflictions. Seasoned orthopedic spine surgeon Dr. Payam Moazzaz will work with each individual patient to determine the best course of treatment for their specific symptoms; whether it takes the form of medication, noninvasive treatments, pain management techniques, surgery, etc. In technical terms, chronic lower back pain does not translate to the briefly suffered pain and stiffness that might ensue as the result of an injury or short-term illness. It is, rather, the type of back discomfort that lasts for more than 90 days and is generally affiliated with a substantially more serious condition or disease. Frequently a mid-life condition, chronic lower back pain could result from an injury sustained early in life, that has never healed up properly. In older folks, this condition could be connected to joint, bone, muscle, or lower disc degeneration. People who don’t exercise or remain active earlier in life may find themselves paying for it later. By contrast, the ACA reports that most instances of chronic lower back pain are not associated with serious conditions like fractures, infections, spine arthritis, and cancers. Spinal stenosis is a lower back pain condition that involves the narrowing of the spinal column, which pressures the spinal cord and surrounding nerve roots, giving way to symptoms commonly associated with a neurological disorder. Spinal surgery is often recommended and necessary to remedy this disorder. Common causes of this lower back condition include age, spinal misalignment, poor posture, bone degeneration or arthritis. At New Era Spine, Dr. Payam Moazzaz can diagnose and treat this illness as he guides you to a successful resolution and full recovery. Symptoms of spinal stenosis can include a burning pain or numbness in the legs or behind, a pronounced weakness in the patient’s lower extremities, a limited ability to lift the feet while walking, and an uncomfortable sensation in the lower spinal area. A herniated disc happens when the outside material of a spinal disc ruptures, thus leading to the emergence of jelly-like material, damaging the nerves and eliciting neurological pain. When the disc shifts but does not rupture, a bulging disc can arise. Both conditions elicit substantial pain or no discomfort at all, depending on the severity of the condition. Both conditions commonly affect the lower back. Also, both varieties of herniated discs can result from vigorous physical activity, and most often afflict patients ages 30 to 50, especially manual laborers and professional drivers. This condition is often treated by way of artificial disc replacement, which can put the patient on the road to an active, pain-free lower back. 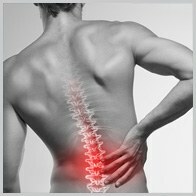 When the spine bends in an irregular curvature, chronic back pain can ensue. Conditions in this category include scoliosis, a side to side curvature; lordosis, a backward curvature of the spine; and kyphosis, a forward curvature of the spine. These spine irregularities can strain the muscles around the spine, along with ligaments and vertebrae. Adolescents, with their developing bones, are the most likely to suffer from these conditions. Dr. payam moazzaz is devoted to the care and treatment of a vast variety of spinal issues, including lower back pain. Visit New Era Spine so Dr. Moazzaz can determine and diagnose the cause of your lower back pain and what can be done to end the pain. His goal is to return you to your normal full and active life! Please call today to schedule an appointment.